The Ursuline congregation was founded by St Angela Merici in Brescia, Northern Italy in 1535. Angela lived in a time of great disruption in both church and state. Her biographers describe her as a woman of deep prayer who sought to bring a Christian response to the needs of the times. She placed particular value on the influence and role of women in effecting change and reform. Subsequently, the Order spread rapidly through Italy and thence to France where the Congregation established schools for the education of youth. In 1771, through the persuasion of Nano Nagle, four Ursuline Sisters from Rue St. Jacques in Paris came to Cork to make the first Irish foundation. Foundations followed in Thurles in 1787, Waterford in 1816 and Sligo in 1850. The Fleur de Lis, right and left of the cross, recalls the patronage by the House of Bourbon to the St. Jacques Monastery. 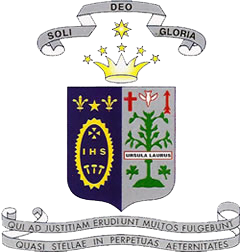 Motto, taken from the Book of Daniel, was adopted by the order from its early years: “Those who instruct many unto justice will shine like stars for all eternity”. Justice in the Old Testament has often been understood as Right Relationships – with self, others and all of creation; this then forms a significant part of the Religious and Educational Philosophy of Ursuline schools. The Crown and Stars represent the award promised to those who fulfil the words of Daniel, and to all who live for the Glory of God alone: “Soli Deo Gloria”. The Ursuline motto “Soli Deo Gloria” (All for the glory of God) is understood and experienced in 2015 in the context of Angela Merici’s spirit and words. Angela’s spirituality was marked by contemplation, an open relationship with others and a willingness to serve. This was founded on a deep trust in the Trinity whom she invoked in the first and last sentence of her Letter and Counsels to her companions. Angela had an exceptional capacity for relating to others- to young and old, to rich and poor, to people in all walks of life. She urged her Company (the Ursulines) to have the same kind of gentle, courteous, respectful relationship with others and to recognise each person as precious to God and created in his image. Today, “Soli Deo Gloria” means that we glorify God in our recognition of his Spirit dwelling in us and in others, in the wonders of creation and especially in those Jesus called the least of his brothers and sisters.